Young people in South Africa face many challenges as they move more into the realm of adulthood. With Youth Day coming up on June 16th we wanted to find a way that we could assist the youth and make a meaningful contribution to their future. The topic of youth employment has been discussed regularly in the media as well as parliament. Jobs are scarce and it can be difficult to get a foot in the door for an inexperienced candidate. On Friday the 15th June we will be broadcasting live on Facebook and Instagram throughout the day answering questions and giving insight into what it takes to get started in the working world. We will be joined by students Thasmika Mohan, Valentine Sterling-Court, Jasmine Allan, and Lungelo Saule who will be speaking with members of the multiSEARCH team on various topics and questions as well as being part of a job interview scenario to share tips on how to ace that first interview. Follow us on Facebook, Instagram and Twitter to see updates, fun info regarding the day, or to ask a question. 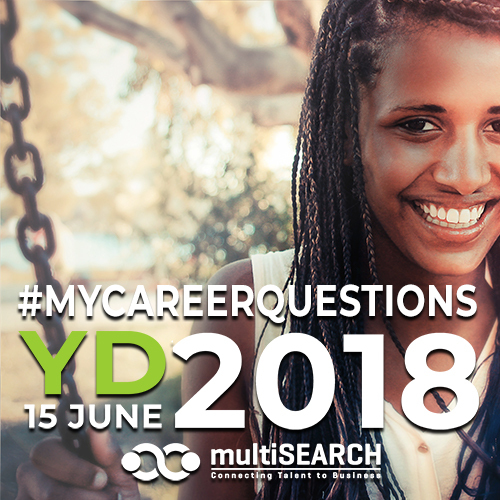 You can send your questions on Twitter, Facebook or Instagram using the hashtag #mycareerquestions and we will compile them and answer as many as we can on the day.